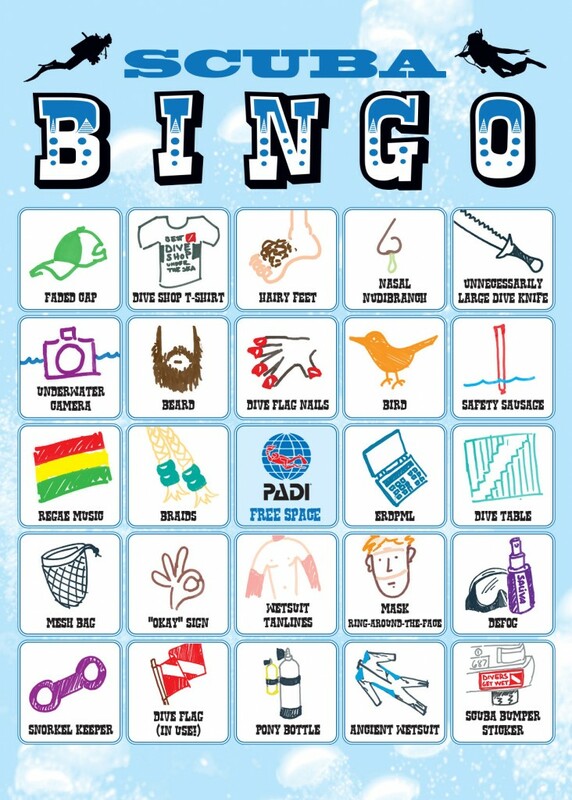 Using a laminated BINGO card or waterproof list, divers search for objects underwater. The objects can be poker chips hidden in a wreck, or natural objects like a sleeping octopus, a rock that looks like an egg, etc. 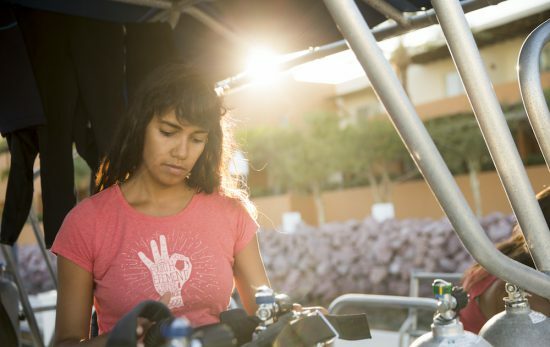 For natural objects, divers snap a pic with an underwater camera in lieu of removal. There are a few variations on the spoon race, but the basic premise is balance an object on (or under) a spoon and swim as fast as you can without losing it. In this video from Utlia Dive Center, divers balance eggs on a spoon as they race to the finish line. Another option is to use an upside down spoon to keep a ping pong ball from escaping to the surface. For an added challenge, divers can try to hand off the egg or ping pong ball to a partner – relay race style. Divers can test their skill at hitting an underwater target using a toypedo or other throwable object. For an added challenge, try tossing the toypedo while hovering. Underwater hockey is played in a pool with snorkel gear and curved sticks that are only a foot (.3m) long. World championships take place every two years and with approximately 25 different countries vying for the title. A more extreme version was played upside down under ice. 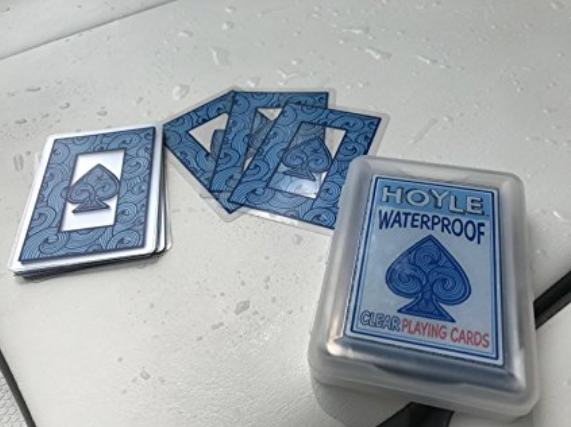 Using specially-made waterproof playing cards, scuba divers can enjoy many common card games on an extended surface interval, as part of an underwater poker tournament, or by participating in a poker run. During an underwater poker run, divers navigate to different checkpoints where they receive a playing card. After visiting all the stops, the diver has a poker hand that may win them prizes. Conniving buddy pairs have been known to exchange cards to create an ideal hand before surfacing. If organizing a poker run, make a unique mark on the cards for each stop (a red dot for the cards handed out at the first stop, a green dot for cards from stop number two, etc. 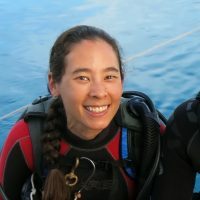 ), or record what card each diver receives, so they can’t be easily swapped. Fans of underwater rugby call it “the only 3D sport.” Besides being a contact sport, underwater rugby does not have a lot in common with topside rugby, but both are fun to watch. In underwater rugby, players attempt to put a saltwater-filled ball into a basket anchored to the bottom of the pool. Anyone with the ball can be “attacked,” but must be released if they lose contact with the ball. Players are prohibited from blocking the goal (by sitting in the basket, or laying on top of it), but they may actively prevent the ball from going into the basket by grabbing the ball, the opposing player’s arm, etc. Swimming through a suspended hula hoop is one of the fun activities you may try as part of the Peak Performance Buoyancy specialty course, and it’s also a great component to an underwater obstacle course. Swimming through a web of bungee cords or criss-crossing PVC pipe can also be a fun challenge. For advanced divers, create a passageway that requires the scuba unit to be removed and push it in front of them. 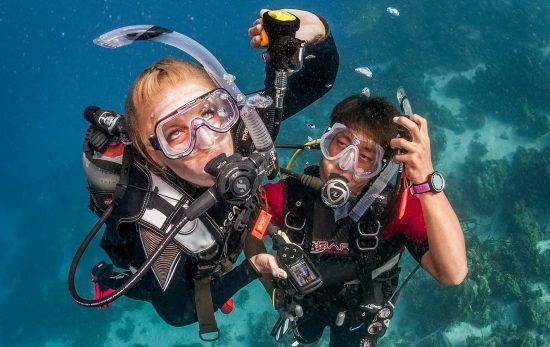 To ensure this activity is fun and safe, ensure there are safety divers accompanying participants ready to provide assistance and an additional air supply. Underwater pumpkin carving contests are a popular activity conducted in lakes, quarries and oceans throughout North America. Check out these helpful underwater pumpkin carving tips from our friends at DAN. 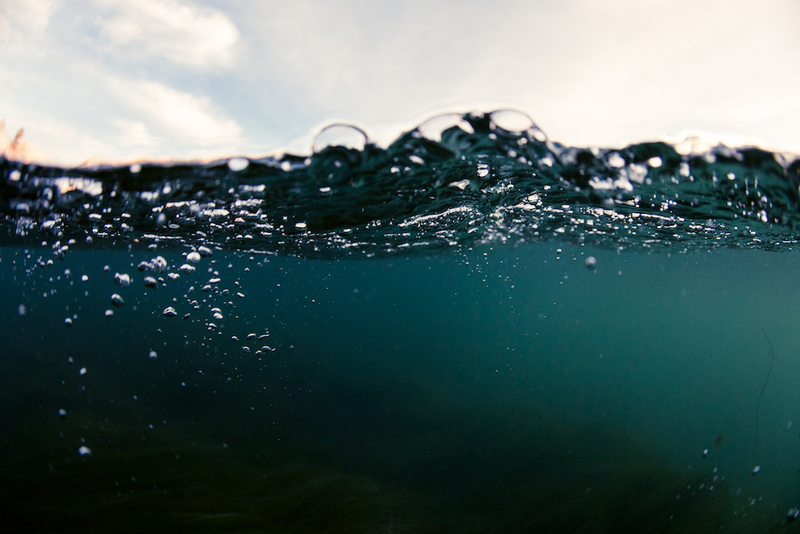 As divers, we like to feel as though we’re one with the fish – gliding along effortlessly and moving with the current. But have you ever tried propelling yourself underwater the same way you do on land? Hand your fins to a buddy and try “running” along the bottom of a pool. It’s even harder (and funnier) than you might imagine. For added hahas, challenge another buddy pair to a race across the pool. Chess, checkers, dominos, even tic-tac-toe on a dive slate becomes infinitely more challenging when buoyancy is involved. Use weighted playing pieces and have each player hover for the entirety of the game. Contact a PADI Dive Center or Resort to find out about fun underwater activities in your area.